Lean management or lean production is a method for the creation of efficient value chains and the elimination of waste. Lean was originally developed by Toyota in the car manufacturing industry. 2 What tools are used in lean management? 3 What is lean service management? 4 Is lean service management 'ITIL light'? 5 Is the YaSM process model compatible with Lean? Lean is about defining the value of a product or service from the standpoint of the end customer, improving the flow of work and creating more value for customers with fewer resources. It's not a strictly defined framework but a set of principles. Organizations applying the Lean principles have experienced increases in profitability and customer satisfaction as a result of reducing their lead times, improving product quality and eliminating waste. Over the years, lean principles have also been successfully applied in many areas outside manufacturing, including the service industry. What tools are used in lean management? Lean management is supported by a number of methods or 'tools', such as Kanban and 'Value Stream Mapping'. Value stream maps (VSMs) describe the process steps that a business uses to create value in the form of products and services. VSMs typically highlight information for each step in a process, for example processing and wait times, work effort, error rate, etc. Organizations use VSMs to identify areas needing improvement. What is lean service management? Lean service management is the application of lean thinking in service provider organizations. Service providers can already choose from a number of frameworks and standards such as ITIL®, COBIT® and ISO 20000 which describe time-tested best practice. Lean is not a replacement for these service management frameworks. In fact, Lean does not provide any specific guidance for managing services. But Lean can be a valuable addition to the management practices used in the organization. It helps that both the service management frameworks and Lean have a long history and there is some common ground between them. For example, continual improvement is the guiding principle in most service management frameworks. ITIL, in particular, promotes the concept of the service lifecycle, with continual service improvement as a key process. The service management frameworks are also concerned with first-time quality. They include activities such as requirements gathering, service specification and testing of all service components, to ensure that the services are fit for purpose as they go live. Problem management is another example for a service management process in the spirit of lean thinking, where issues are exposed systematically to improve service quality and reduce work further downstream. This is especially true of proactive problem management, which seeks to identify problems before they result in service incidents. Is lean service management 'ITIL light'? 'ITIL light' is not a well-defined term. It's often used to describe a solution for organizations that find the whole of ITIL too much to absorb, and therefore ITIL light often contains a subset of the full ITIL process list. There is nothing wrong with picking and choosing from the ITIL framework, but it's not quite the same as applying lean principles. Even if organizations choose to introduce only a few ITIL processes, such as incident management, problem management and change management, they should still try to eliminate waste, unnecessary steps and bottlenecks in these processes. So lean service management should not be confused with ITIL light. Is the YaSM process model compatible with Lean? Lean is about efficient processes, free of process steps that don't add value, so the YaSM process model chimes well with lean principles. Simple, clear-cut service management processes were a key objective when creating the YaSM model. In line with lean principles, all process steps contribute to the process outputs, and there are no redundant activities leading to duplication of work. The YaSM processes are also understandable and easy-to-read. This supports the aim of Lean to simplify the operational structure so the organization is better able to understand and manage its work environment. What's more, applying lean principles and identifying areas of waste is only possible if processes are transparent and documented. Organizations thus need to map their processes, and the YaSM model makes this easier with ready-to-use and flexible process templates. [IT Process Wiki - ITIL Processes]. -- S. Kempter: IT Process Wiki, "ITIL service lifecycle and ITIL processes". - IT Process Maps; Lindau (Bodensee), Germany. [IT Process Wiki - ITIL CSI]. -- S. Kempter: IT Process Wiki, "ITIL CSI - Continual Service Improvement". - IT Process Maps; Lindau (Bodensee), Germany. What is Lean? › What is lean service management? 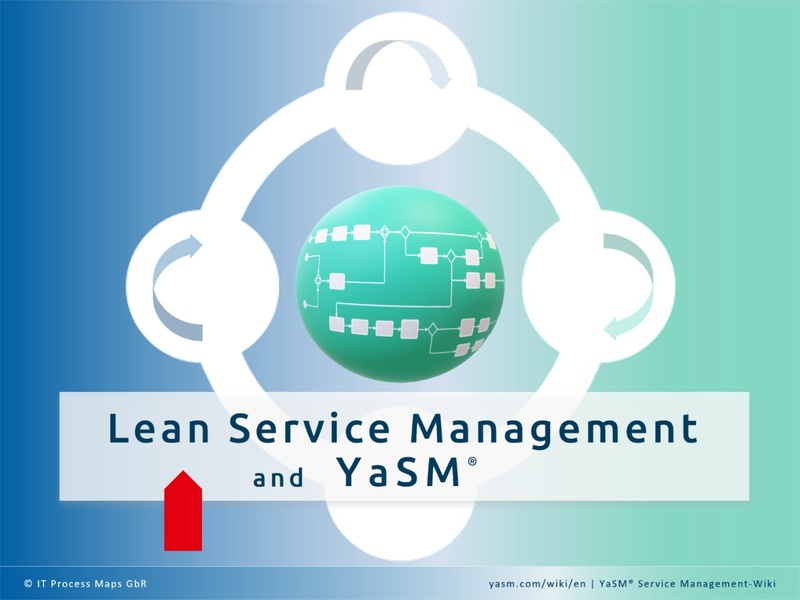 › ITIL light and Lean › Are YaSM and Lean compatible?